We are so thrilled to see one of the projects outlined in the Evergreen Trails Master Plan come to fruition with the new pedestrian crossing at the RTD Park and Ride located at Christ the King Church. 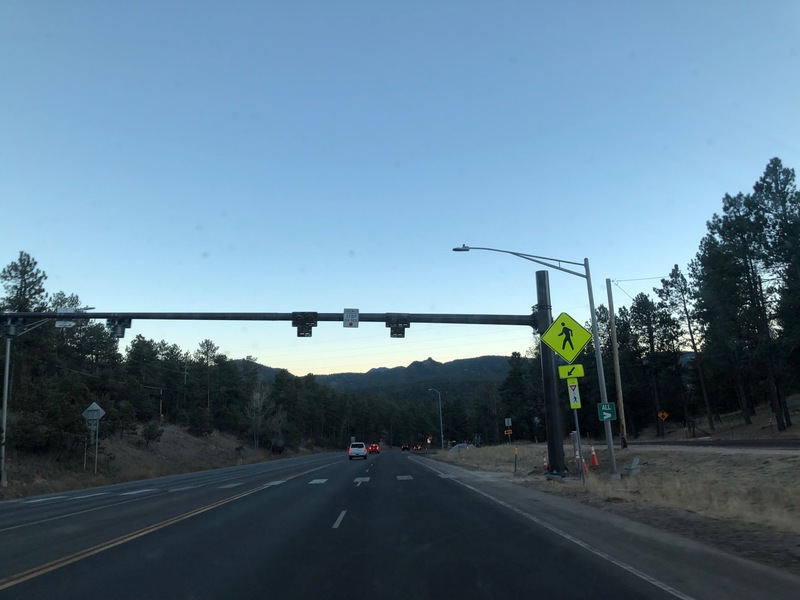 Identified as one of the most dangerous crossings in Evergreen due to it’s location where Highway 74 transitions from two to four lanes and increases in speed for northbound vehicles, this crossing will make pedestrian activity far safer and more visible to motorists. This crossing also connects an important link not just from the Park and Ride, but from the entire Pioneer trail to Meadow Drive, which also has a master plan for a future continuous trail connection down the Jefferson County road to the other end of downtown. We’d like to thank the great folks at the local CDOT operations here in Evergreen who helped to push this through and got it done. These guys have been great to work with and are really working hard to keep the CDOT right of way in Evergreen safe. Huge shout out to the good people at CDOT for a beautiful pave job on Evergreen Main Street. Not only were the travel lanes milled and overlayed, so, too, the paving extends from curb to curb. As unincorporated Jeffco, our hamlet’s county road and state highway maintenance are dictated by rural design standards. Those rural guidelines only provide for paving maintenance of the the travel lanes themselves, not parking lanes to the curb. On behalf of the board of the Downtown Evergreen Economic District (DEED), we say thank you to the great folks at CDOT, especially Steve Harelson who, for years worked with Dean Dalvit, DEED, to get curb-to-curb paving on this round of milling and overlay, despite the rural design standards. Special thanks, too, to Bill at CDOT’s Kittredge shop for the boots on the ground making it happen. CDOT’s scheduling motivation for the milling and overlay downtown was the result of maintenance funds finally allocated after schedule delays in 2015, 2016 and 2017. Was the national bike race a catalyst to the schedule? Yes, by 4 days. CDOT moved their schedule up four days so that we’d look great and provide a safer surface for the riders and spectators. We are grateful for their ‘above the call of duty’ curb-to-curb treatment of Main Street. We are grateful for the countless hours spent in meetings with us and appreciate the great relationship DEED has with the committed, hard working men and women at CDOT that support our ability to drive, park, shop, walk and bike pleasurably and safely around our beautiful town. The Final Trails Master Plan for the Greater Downtown Evergreen Area is complete. In partnership between the Greater Downtown Evergreen Economic District (DEED) and Jefferson County and funded by DEED’s Evergreen Legacy Fund (ELF), this plan is offered to the community and for the community to use in development of future trails projects, grant applications and visioning for how the Greater Downtown Evergreen can develop and maintain safe and effective pedestrian connectivity. Please contact any of us at DEED on how you can help progress this Master Plan into actionable projects for your group or organization.